Excuse us for living, but we all owe a debt of gratitude to our ancestors! They may have started a family business on the high end of accomplishment. They may have been a dismal failure on the lower end, providing us with a negative example as to the pitfalls of life. But whether success, failure, or everything in between, our ancestors are the foundation on which we have built our lives. Salvatore Fontana, my paternal great grandfather (my father’s mother’s father! 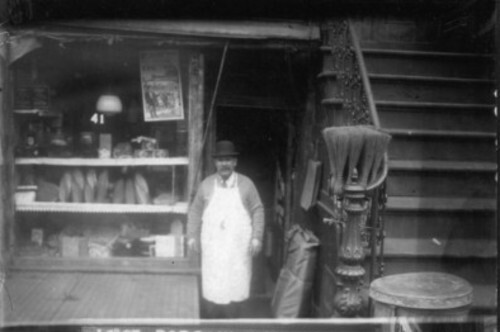 ), standing in front of his grocery store at #41 14th Street between 1st & 2nd Avenues, in Little Italy, New York City, c. 1930’s. My ancestors’ greatest contribution to our family’s past was the salutary act of immigrating to the United States from Italy in the late 19th & early 20th centuries. Like so many in this second wave of immigration in American history (the first wave being the Catholic Irish mid-19th century), they were the poor of southern Europe. My ancestors were among the masses of peasants from the island of Sicily that crossed the Atlantic in the steerage of the ships. Quite unusual, to say the least, and still the source of skepticism within our family over 100 years later, is our ancestors’ story/claim. The so called “facts” are that one set of paternal grandparents, my grandfather and grandmother, came to America as children separately, different ships, years apart, from the same little village of Vila Bata, outside Palermo, Sicily. But the “clincher” is that each family’s surname was “Fontana” – -from the same village! – -and they claimed not to be related! – -Possible. – -Also possibly cousins “three times removed” or whatever! All this is background to establish my bona fides to be quite comfortable when it comes to what I dub “peasant food.” Every ethnic group has their basic traditional dishes that go back to “the old country” or “when we were poor and came to America.” And these recipes are handed down to us and perpetuated generation after generation and the dishes enjoyed with much delight. It was in this spirit that a year or two ago I said to wife Geri, “I’ve never heard of a pasta recipe with pepperoni. Maybe there is one out there but I never heard of it.” I was familiar with pepperoni and eggs as a late night-early/wee hours/morning treat from my youth and decades ago with my crony friends. But pasta and pepperoni? – -Never! And why not? “There should be some kind of recipe like that, basic and simple,” I continued. And as with similar “brainstorms” over the years, Geri asked, “Like what? What should be in it?” “Oh,” I said, “the basics like garlic and oil, onion, a little parsley and sliced pepperoni.” And again like so many times before with my crazy ideas, I left it to Geri, the real cook/chef, to work her magic, transforming my conception into a real recipe and a respectable, delectable dish. And so Pasta Pepperoni was born! Geri changed the onions to scallions, naturally. And she decided on Fettuccine pasta rather than spaghetti, which turned out to be a good choice as our preference. (Maybe you would prefer spaghetti or another pasta.) First try we used Hormel pepperoni and felt it was too light by taste. Since then we switched to Blackbear for a stronger taste! (Geri says Bridgeford is good too and you may have your own favorite brand pepperoni.) And we slice the pepperoni not thinly but generously at least 1/8th inch thick! The finishing touch was the first time we served the dish to our #1 son, Andy, and daughter-in-law, Erin, and asked for suggestions. And they made a simple, good suggestion; red pepper flakes! We put that into the recipe and the taste went “over the top”! – -Thanks, Andy and Erin! 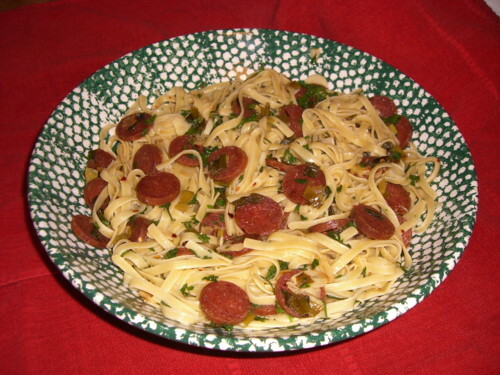 What I would refer to as another Sicilian peasant dish, Pasta Pepperoni can be added to our list! It’s robust and not for the faint of heart! – -So good it’s unreal! – -A knock out! – -You can’t miss! Now nobody said this is healthy! Eat it infrequently and at your own cholesterol risk! Sauté scallions, garlic & red pepper flakes in the oil in medium sauce pan until tender, 4-5 minutes. Add sliced pepperoni & heat gently. Remove from heat. Cook pasta in boiling, salted water until al dente. Drain in colander. Toss with sauce & chopped parsley. Excuse us for living, but eat this & you’ll know you are living! Sharing with family and dear friends creates the perfect moment–and where’s the wine!!! I love seeing the old photos and hearing of the past history! But as you say phil-not for the Cholesterol shy…lol…kudo’s to Geri! Marg, This is definitely an unhealthy recipe….just good!!! And yes, as you can tell, the fun is the old photo & the ancestor part as “the hook” to ethnic food & this new recipe. Couldn’t do this without Geri’s help!!! Thanks as always. See you soon! Phil & Geri too! Love this post Phil! My ancestors hail from Sicley, The Venician Region and Marche! Very nice!! Thanks Phil! yo quiero pepperoni! Looks so yummy!! Thank you so much for the introduction of the pasta! I keep the recipe and would love to try it someday 🙂 Have a great week Phil! I will check the rest!! I tried the Pepperoni Pasta on Friday – what a delicious meal – it is easy and you are right, it knocks me out 😀 I used fettuccine as well. Thanks so much Phil and hope you have a wonderful week ahead! Indah, You are “something else” to try & like that Pepperoni Pasta!!! Are you part Italian??? HA!!!!!!!!!! Fettuccine is really nice isn’t it!!! Indah, you definitely like “the spice of life”!!! If I am ever in Rotterdam again, you will know! The closest will be wife Geri & I in Amsterdam this October but only for a few free hours before boarding a riverboat cruise down the Rhine to Basel, Switzerland. Ciao, Indah!